Tree rings are Original Gangsta data visualizations. Yep. 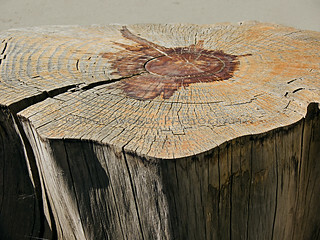 If you look at a cross section or coring you can count the years the tree has lived and you can examine the aberrations in the rings to determine what years were particularly good (or bad) for the tree, and see when infections, blights, lightning strikes, or other events afflicted the tree. I kinda knew this stuff, but I never really thought that there’s a lot more to it. There’s a lot more to it. The tree rings tell us about the tree itself, but it also tells what happened in the world that triggered a reaction from the tree. This field is called dendrochronology, and strangely, it’s a pretty young field. Astronomer Andrew E. Douglass formalized the field when he began looking at the rings of trees to see if he could detect historical 11-year sunspot cycles. Douglass’s work was based on a pretty small data set so not many people, other than Douglass, are convinced you can. But people did smell what the Andrew Douglass was cookin. Trees give us about 400,246,300,201 individual visual records of history to look at and now we have fields such as dendroclimatology using tree rings for insights into the historical climatic conditions of the Earth. Tree ring research has been radically changed by the Internet (Like just about everything else.). Now researchers can add their tree ring data to the International Tree-Ring Databank and look at data by species from 5 continents. OK. I’ll stop here as I’m probably over-sharing my affinity. But if you’re up for nerding out more, I encourage you to check out H.C. Fritts’s “Tree Rings and Climate.” It is a fascinating and very expensive book. Google Books has chunks of it available for your perusal.